IoT brings convenience to our fingertips, while making our lives safer and more efficient. Connected devices are growing at a fast pace, and according to Gartner, there will be more than 20 billion connected devices by 2020. Even though the IoT market is growing rapidly, there are currently some challenges to address in product development, such as the associated time and resource costs which can make it extremely difficult to successfully build IoT devices. IoT devices are very complex with the needs of connectivity, security and low power features. Arm Mbed OS is a free, open source platform operating system that includes all the necessary features to facilitate the development of IoT connected products, including standards-based security and connectivity stacks, an RTOS kernel, middleware for storage and networking, and remote device management. It is developed by Arm and our partners to tackle the challenges of creating and deploying IoT devices. Mbed OS have a vibrant community of 360k+ developers and 120+ partners who are contributing to Mbed and interacting on its vibrant forums. Based on the feedback we got from companies building IoT devices, the biggest challenges faced by companies dealing in product development is to avoid longer than expected delays and reducing the cost of product development. As per this EEtimes survey, more than 59% of embedded developments do not adhere to schedule and the average product development cycle is more than 12 months. One of the major reasons for companies not being able to develop their IoT product in time is a lack of support and access to IoT experts when they are stuck during the development process. We are launching Mbed Commercial Support to provides our highest level of support, efficiently resolving technical challenges that your project may encounter for devices based on Mbed OS. We focus on minimizing your issue’s time-to-resolution and assign a designated team to provide the best help, as fast as possible. 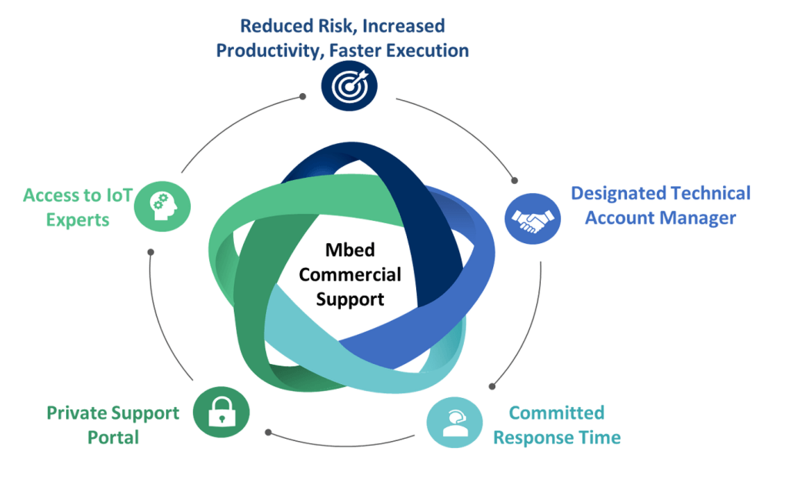 Mbed Commercial Support reduces barriers to production with committed support when you are stuck. We prioritize troubleshooting and resolution of bug fixes, giving you access to Arm’s IoT experts who are key contributors in the IoT market and to Mbed. World-class IoT expertise with extensive Security and Connectivity knowledge. Proactive, focused help with committed SLA to ensure that you meet critical deadlines. Your technical account manager knows your project’s goals, technical environment, and business needs, and coordinates activity across Mbed teams on your behalf. Ask questions and exchange information in secure, private portal. Support for custom IoT devices that you are planning to deploy.